It’s that time of year again!! Our 2011-2012 season will commence on 3rd September 2011. Over the summer months our competitive squads have continued training hard. 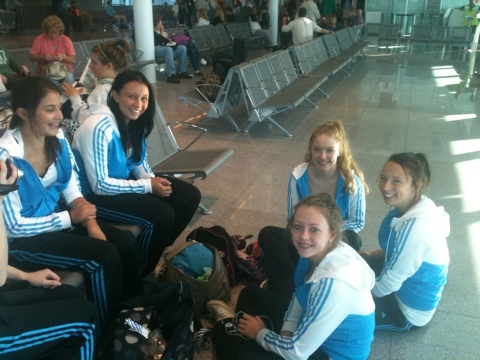 July saw 15 of our gymnasts travel to The Scottish training centre in Largs for a week long intensive training camp. In August our 5 senior gymnasts and coaches Evelyn, Andrea and Rachel travelled further afield to Pennsylvania to attend the International Gymnastics Camp. An amazing experience for all. Now we are excited to begin our new season!! We hope you all had a nice and relaxing summer and look forward to welcoming everyone back next weekend!!! At the beginning of August our 5 senior gymnasts Ali, Beth, Julie, Ciara and Elaine along with coaches Andrea, Evelyn and Rachel, travelled to the International Gymnastics Camp in Pennsylvania. Through the course of the week, the gymnasts had the privilege of being coached by Svetlana Boguinskaia (former Olympic Champion), Jana Bieger (World Cup winner & USA national team), Andrea Bieger (former Olympian) and Abie Grossfeld (former Olympian & Olympic team coach). They also got to meet Paul Hamm (2004 Olympic Champion) who is currently training to try make the 2012 USA team. Apart from the amazing gymnastics, the camp life experience, recreational activities and entertainment provided by the staff at IGC throughout the week was fantastic. This was a very exciting trip for all involved and an experience that we won’t forget for a long time!! 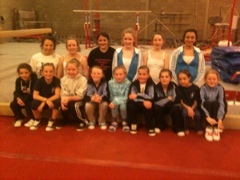 Comments Off on International Gymnastics Camp! !